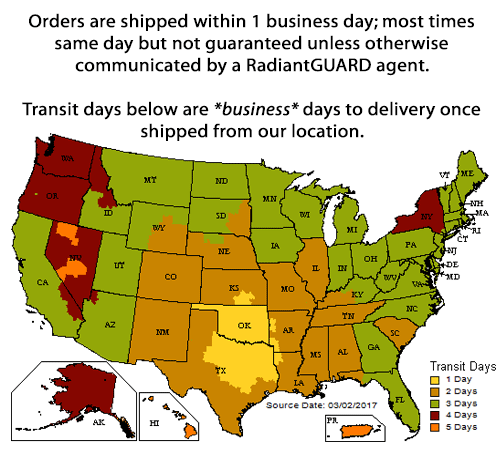 While researching radiant barrier insulation online, many consumers are coming across paint products erroneously marketed as radiant barrier paint which are intended to be sprayed to the underside of the roof rafters to lower the emittance of radiant heat from the roof decking into the attic space. While these products do help to lower the amount of heat that radiates into the attic space, the use of the term radiant barrier paint is false advertising and these products don't offer near the protection against radiant heat as a radiant barrier foil insulation product. All surfaces emit some amount of radiant heat; some more than others. For example, red brick emits (radiates) 90% of absorbed heat from itself, concrete 92%, and plywood up to 98%! That means the plywood decking of your roof transmits almost 100% of the radiant heat from the sun into the attic space. Without protection from this radiant heat, your attic heats up, any air conditioning ducts in the attic heat up, your living spaces below the attic heat up and your air conditioner runs more often. When this happens, your wasting valuable money trying to keep your home at a comfortable temperature. However, aluminum radiates only 3% which means 97% of the radiant heat is BLOCKED! Radiant barriers, made of pure aluminum, are ideal to install to the underside of the roof plywood decking in an attic to BLOCK the majority of radiant heat from entering the attic space. To join in on the popularity of radiant barrier, some reflective paint manufacturers have begun falsely advertising their paints as radiant barrier paint. According to the American Society Testing and Materials International (ASTM), only those products tested under test C1313 and result in an emittance of equal to or less than 10% can be classified as a radiant barrier. The best of these reflective paints has an emittance of 14%. A more accurate name for these reflective spray paint products is an Interior Radiation Control Coating (IRCC) and ONLY if they are tested under ASTM C1321 and result in an emittance of less than 25%. A majority of these so-called radiant barrier paint products do NOT pass ASTM C1321 and therefore, are not recognized as IRCCs yet alone as a radiant barrier. Consumers should be aware of such false claims by manufacturers when researching radiant barrier insulation and alternatives. Not only does a true ASTM C1313 tested radiant barrier outperform all reflective paints on the market by emitting less heat, radiant barrier insulation is also much easier to install. Radiant barrier foil can be install by any DIY handyman that is comfortable being in an attic space whereas a reflective paint is typically installed by commercial installers requiring special respiration masks due to paint fumes and special pressurized equipment necessary for spraying. Even with the best reflective paint, the consumer needs to be aware of practices such as over and under application of paint and diluting of paint with water to make the coverage area greater. Such techniques commonly practiced reduce the effects of the reflective paint and/or run the project installation costs up. lay the radiant barrier over the attic floor. All of the above install locations ensures that the radiant barrier is properly placed to block 97% of the radiant heat by allowing only 3% of it to reach your attic floor and transmit into your living spaces. That's a significant drop in heat transfer which results in cooler livings spaces that require less air conditioning resulting in lower monthly utility bills. Visit our website for more information and to buy radiant barrier. Questions? Chat with us online, create a support ticket, or call toll free (866) 528-8412.